Positive outcomes depend on two factors—the quality of the facilities and the quality of the participants. This guide focuses on the former of these factors: Online conference facilities. First, consider your oine conferences. They don’t take place in broom closets. They are held in conference rooms. So why do so many companies conduct their online conferences in digital broom closets? 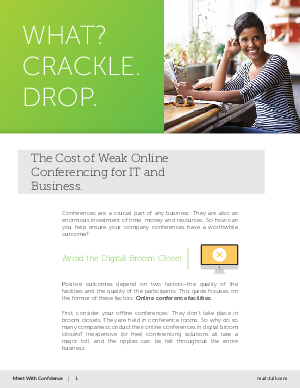 Inexpensive (or free) conferencing solutions all take a major toll, and the ripples can be felt throughout the entire business.